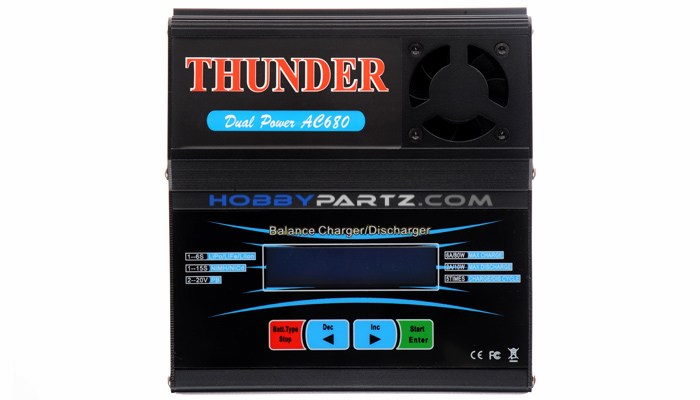 HobbyPartz is proud to present you the All-New Dual Power Thunder AC680 1-6 Cell LiPo Charger. 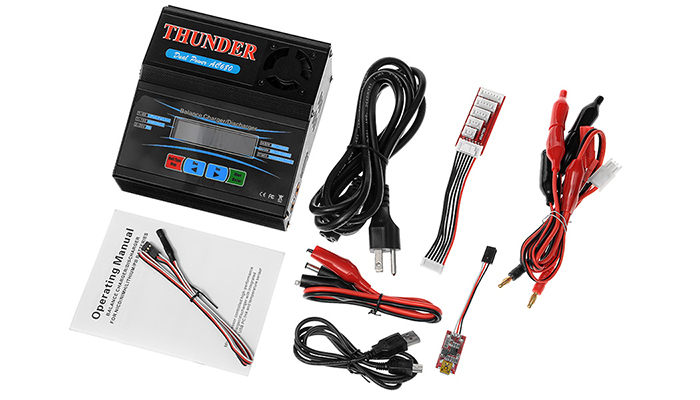 For those that are familiar with the always popular Thunder AC6 charger, the AC680 is basically an upgraded version of the AC6. 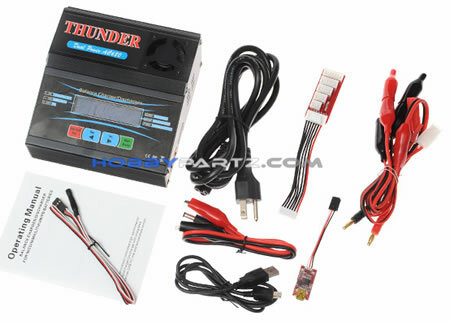 The noticeable differences in feature is that the AC680 has a bigger Power Supply, can charge MUCH FASTER and is capable of handling the BIGGER LIPOS and also can charges at 6.0amps compare to the AC6 at 5.0amp! 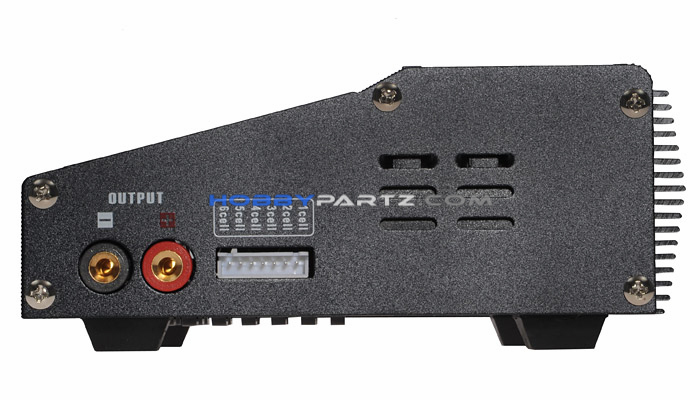 For the advanced user, the professional AC680 charger INCLUDES a PC based program that can analyze the characteristic of the battery through the computers USB port. The software will graph voltage, current, capacity and temperature curves. It also shows the individual voltages of each cell in the Lithium battery pack. Also feature LCD display and High-quality aluminum case with built-in fan is durable and very efficient to cool out the internal heat. 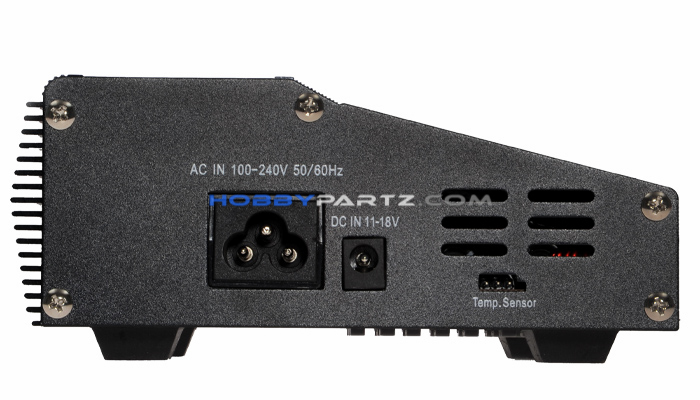 The smart charger employs a circuit that has maximum output power of 80W. As a result, the smart charger can charge or discharge up to 15 cells of NiCd/NiMH and 6 series of Lithium batteries with maximum current of 6.0A. Built into the smart charger is an individual-cell-voltage balancer. No external balancer is needed when charging Lithium batteries (LiIo/LiPo/LiFe) for balance charging. The smart charger also can monitor and balance individual cells of the Lithium battery pack during the discharge process, as well as the charge process. If the voltage of any one cell varies abnormally, the process will be stopped with the error message. The smart charger can accept three types of Lithium batteries - LiIo, LiPo and LiFe. They have different characteristics by their chemistry, such as minimum, maximum, and charge termination voltages. The smart charger offers additional Lithium programming. Fast charge reduces the charging time of the Lithium battery and the Storage mode controls the final voltage of the battery to be suit for long time storage. 5 data of different batteries programs can be stored and retrieved. These data files can be recetrived at any time you need them without reprogramming. The smart charger can perform 1 to 5 cycles of charge>discharge or discharge>charge for battery break in/refreshing and balancing.